Charity has a new children's song to download. This month, it's Rockstar. This month's song, Rockstar, is a rallying cry to dance your dance, sing your song, shine your light, stay grounded and keep loving all along the way. Grab your kids, pick up a hairbrush or your air guitar, and call upon the music within you. You Know What To Do: SING, DANCE, LOVE, ROCK, SHINE. 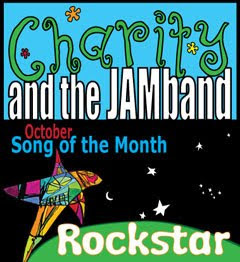 Cuddlebug's favorite Charity & the JAMband song is still Peanut Butter and Jam. You can listen on the main page of Charity's website.